The laptop comes with a curved 21-inch IPS display sporting a 2560 x 1080p resolution and a refresh rate of 120Hz. Almost after a year of its launch, the Acer Predator 21X has finally been brought to India. The Predator 21X was first unveiled at IFA 2016 but at the time the specifications and price of the device were not known. The 8.5 kilogram laptop offers top of the line hardware and is priced at Rs 6,99,999. The main attraction here is the 21-inch curved IPS display which has a resolution of 2560 x 1080p and a refresh rate of 120Hz. The display is also NVIDIA G-Sync enabled and packs Tobii eye-tracking technology. The laptop will be available via Flipkart and Acer will include an ultra-durable hard-shell carrying case which securely stores the notebook and accessories. 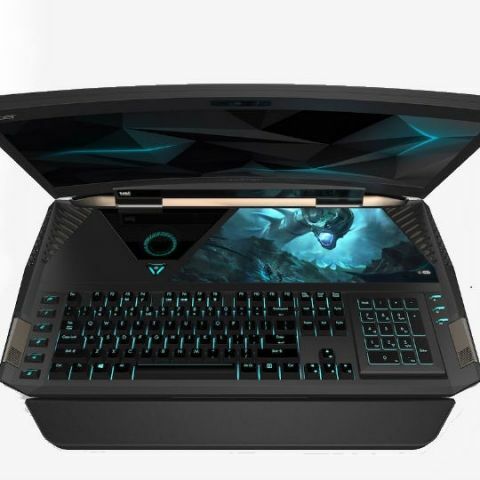 The Acer Predator 21X packs two GTX 1080 GPUs in SLI and is powered by a Intel Core i7-7820HK processor. The laptop features 64GB of DDR4 RAM @2400MHz. The laptop supports upto four 512GB SSDs in RAID 0 which includes 2 NVMe PCIe SSDs. There is also space in the machine to pack a dedicated platter hard drive and it come with a 1TB HDD out of the box. To cool all this hardware, Acer Predator 21X has 5 system fans (including 3 ultra-thin AeroBlade metal fans) and 9 heat pipes. Acer also includes its DustDefender technology, which removes dust build-up and improves heat dissipation. On the keyboard side, the laptop features a full-sized Cherry MX Brown switch mechanical keyboard, with individually programmable backlit keys, offering 16.7 million colour options. Users can swap out the black W, A, S and D keys with teal ones, using the included accessory kit. The numeric keypad can be flipped over and turned into a Precision Touchpad. For audio, the Predator 21X features a 3-way audio design which powered by 4 speakers (2 tweeters, 2 midrange) and 2 subwoofers.